Blog DeskDirector Business Blog What is ‘Grow Better’? How does it apply to MSPs? Growing better means remembering that as a business, you're helping people with unique needs and dreams.Enabling them to interact with you on their terms, not yours. Growing better is about adding value before seeking a reward. It’s not only focused on what you sell, but whether the person you’re selling to is succeeding or not. It encourages you to invest in long term relationships instead of short-term gains, and staying true to your values and making the right decisions even when they are hard. Growing better is not just success – it’s succeeding with a soul. 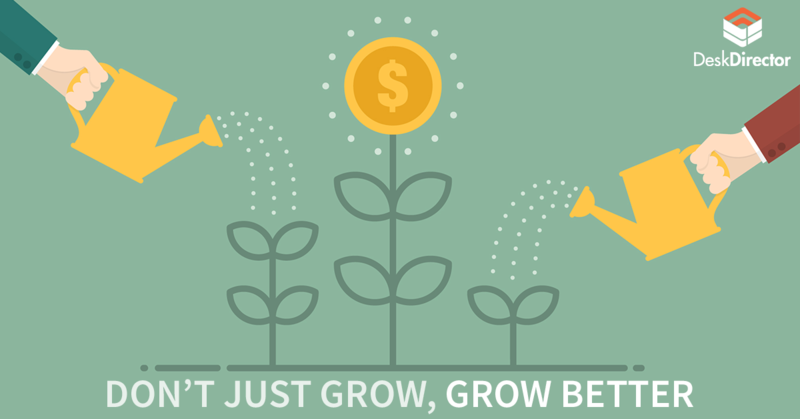 What does ‘Grow Better’ mean for the MSP Industry? Technology was once considered a luxury. Now, it’s a need. Every business small or big needs an ‘IT Guy’. You’re the one who makes sure their data and applications are healthy and secure. 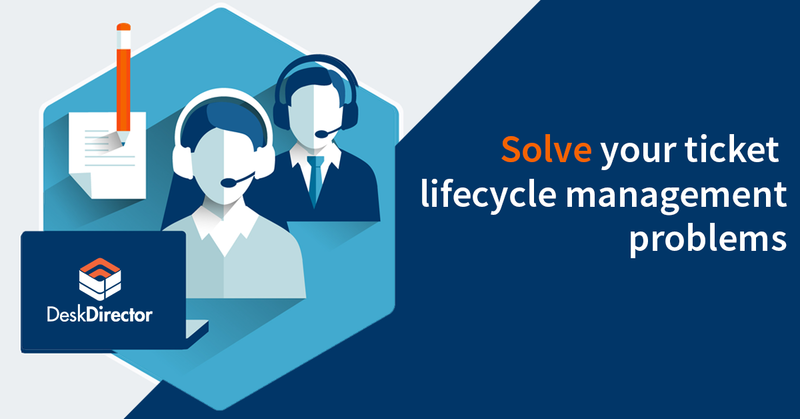 According to SherWeb, 48% of IT market growth will be driven by new customer segments. Your customers are more educated about technology and see the value in it even before they sign up with you. Technology has become a pillar in business – just like finance, sales and marketing. While the value of technology is increasing, the patience is decreasing. 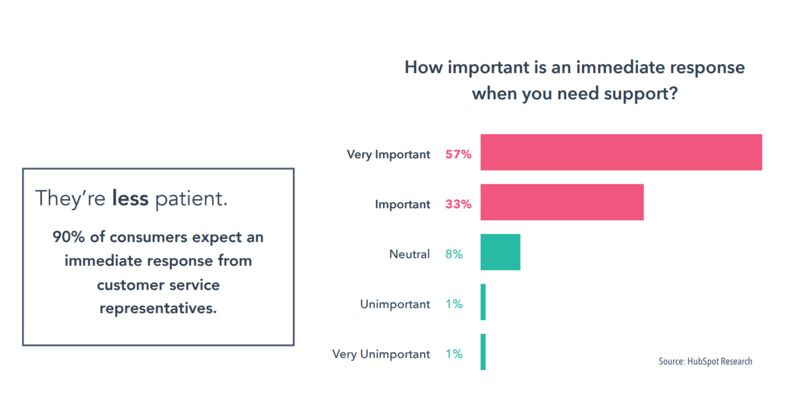 57% of people think it’s very important to get an immediate response when seeking support. This sets an impossible standard for the MSP Industry. DeskDirector helps you meet these expectations with real-time progress updates of tickets. As soon as your customer requests support, the end user will be notified with a ticket number, the person assigned to the task and any updates on the ticket. You can also enable live chat with your customers so that trivial issues can be resolved quickly, and they don’t have to wait for days till support contacts them. Customers don’t trust what your sales and marketing team has to say about your services. Because of this, cold calls and outbound marketing practices are considered obsolete in the industry. Customers are a lot more skeptical than before. You can regain their trust by being perceived as an expert. Show your customers that you understand them and their industry. Every interaction with you should be a learning experience for your customers. Share content with them through your blogs and emails for their benefit. Enable them with knowledge –not just about technology but also about their industry. To summarize, practice inbound marketing – help, educate and enable them to be successful. You can also read our blog on 5 tips to gain trust through your marketing efforts. 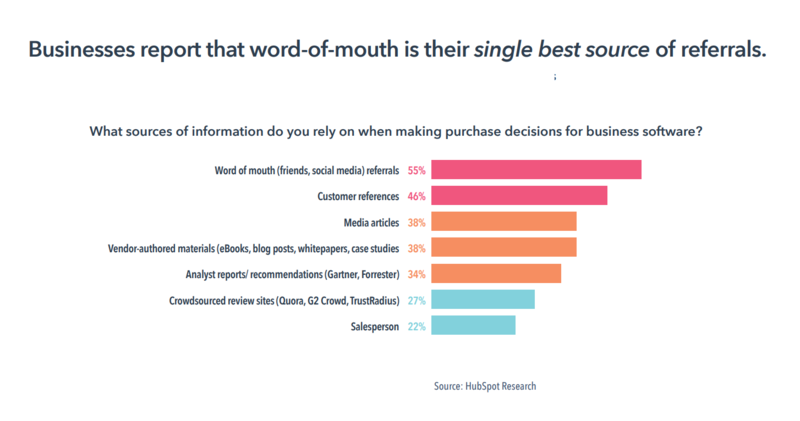 Your customers are your best marketing channels. This is exactly what ‘Grow Better’ means. Your customers are your marketers, their opinions not only matter for your success with them, but also in acquiring new customers. Your emails, ebooks and blogs enable them to consider you as an option. But your reviews and referrals are what pushes them to decide to purchase. You can see how other MSPs ask for referrals here or click the button below. You can also put case studies of your clients on the website so that your prospects can see the work you do for them. Here are 5 reasons why you should invest in case studies today. Most MSPs claim they’re customer obsessed but in reality, they’re self-obsessed. The case studies they have on their website don’t talk about how their customers became successful. Instead, they focus on their own success. They ask for feedback, but they don’t act on it. If you’re asking for feedback, you should be ready to make the changes- otherwise don’t ask. Customer should be your priority, they should always come first. And even though might we think we’re practicing these things, we may be falling down when it comes to a customer-first attitude..
MSPs can apply this by asking for feedback on every ticket using SmileBack – a one-click feedback system that will you calculate your Net Promoter Score. Another way to practice being customer-obsessed is to provide your customer with a client portal that’s customized and personalized to their needs. The portal will give them the power to close, view, fast-track, flag and add notes to tickets. You can provide content – videos, articles, info-graphics – suitable for their industry to will help them succeed. Pro Tip: It’s easier and cheaper to up-sell an existing customer than acquire a new one. Inbound marketing is like building a relationship with people – all people (customers/prospects) first. 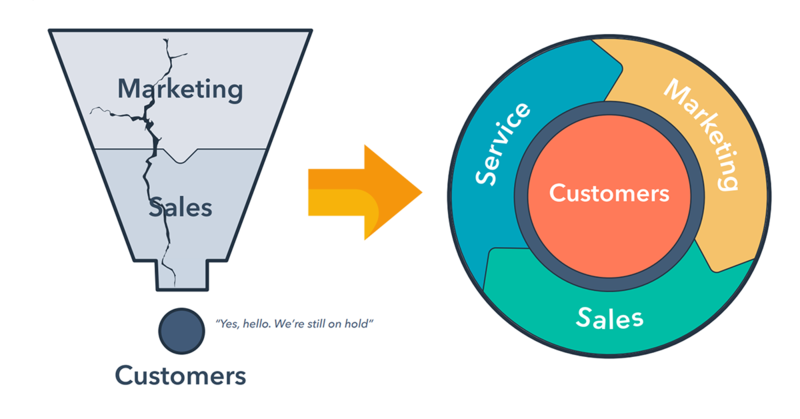 Previously, it’s been visualized as a funnel, with prospects at the top and customers were at the end. This is a great framework to follow when you are looking for leads but does not serve your customers at all. Recently, marketers have shifted to visualizing the process as a flywheel – an ongoing relationship. This concept now places the customer at the heart of the business. This does not see business as different departments, but with people specializing in different fields who feed into this flying wheel to make it move faster. This methodology is ideal for an MSP. We’re a customer focused industry. A lot of MSPs are already putting this in practice, but without this overall conceptualization. MSPs must realize that marketing and sales are not the only important aspects to win new business. They need to give good customer experience at all touch points – from their website to customer support. Customer service has become more important than ever and we provide you the tools to deliver it. You might say that you are customer-first, but in reality are customers eventually. Investment in your customers will give you unexpected returns. Educate, empower and enable your customers to become successful. Establish yourself as an authority - someone they come to for all technology related advice. Leverage technology for business transformation. We hope the information we’ve shared helps you make improvements in your MSP. Want to learn from other MSP business owners? Here is a story by a MSP business owner with 30 years of experience: How to make money, innovate and have fun. 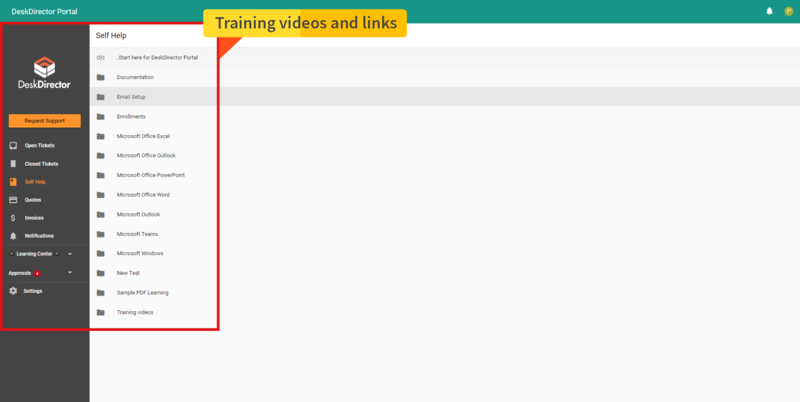 DeskDirector web version is fully responsive on any device. What's coming up?